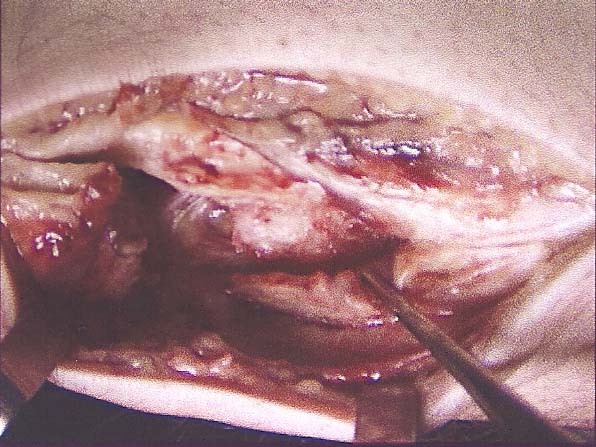 This case report describes an unusual second rupture sustained after conservative treatment of an initial Achilles tendon rupture at the musculotendinous junction. The initial injury was successfully managed conservatively with an equinus cast for 6 weeks. The patient developed a tendonitis 10cm below the initial rupture and subsequently sustained a second traumatic rupture of the Achilles tendon at a new site after tripping on a curb. The patient had no known systemic diseases and was not on steroid or fluoroquinolone therapy. The site of this second rupture was repaired surgically using an open technique without any long term complications. A 37 year-old male, dog-handler from the police force was chasing a suspect when he experienced acute pain to the right posterior leg in the Achilles region. He was unable to ambulate after the initial injury. No previous leg injuries or tendinitis were reported. The patient did not report any history of taking corticosteroids or fluoroquinolone antibiotics. Clinically, the patient had a positive Simmond’s test and rupture of the Achilles tendon was isolated to the musculo-tendinous junction. A clinical diagnosis of Achilles rupture was rendered. No magnetic resonance imaging (MRI) was initially performed and the patient was managed conservatively in an equinus cast for 6 weeks and then in an adjustable boot to bring the foot to ankle range of motion to 90 degrees over the following 6 weeks. The adjustable boot was initially put in 20 degrees of dorsiflexion for 3 weeks then adjusted to 90 degrees over the following course of treatment. The adjustable boot was removed and he managed to walk without crutches. The patient had regained total range of motion of the ankle with no gap or tenderness along the Achilles tendon and good plantarflexion power. Figure 1 Region of second rupture as identified on MRI (arrow). 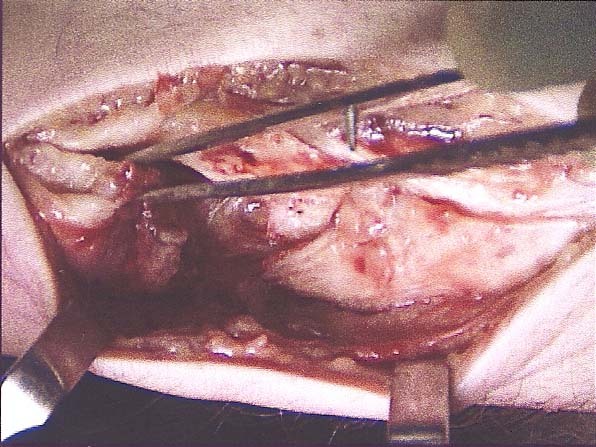 More proximally, the initial injury can be seen at the musculo-tendinous junction. MRI of the site of injury revealed an abnormally high signal change and thickening within a somewhat retracted Achilles tendon 3 cm above its insertion as well as at the musculo-tendinous junction of the gastrocnemius muscle. This was consistent with a full-thickness, high-grade tear or rupture of the Achilles tendon at the musculo-tendinous junction. Intra-tendinous edema associated with the presence of fluid was located within and about the Achilles tendon suggesting the presence of intra-tendinous hematoma. There was also swelling of the posterior surrounding subcutaneous soft tissues. There was little fluid noted within the retrocalcaneal bursa or along the lower aspect of the Achilles tendon about 2.5cm from its insertion. A small region of marrow edema was noted in the posterior aspect of the talus. The tibia and fibula were intact and no fracture of ankle was reported. On his second presentation to the hospital, there was a palpable gap to the Achilles tendon with a positive Simmond’s test. At this time, he was scheduled for primary surgical repair of the tendon. 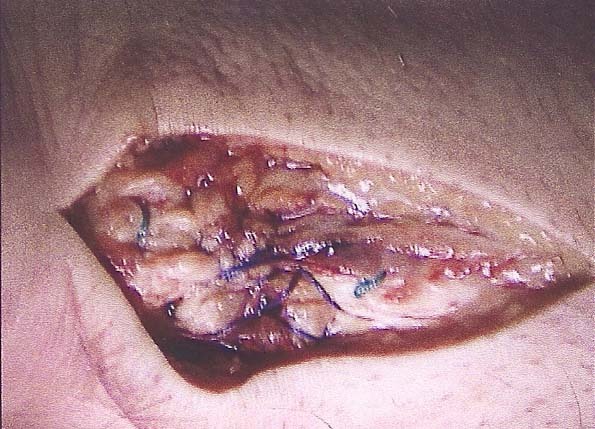 The ruptured edges were identified and re-apposed by a modified Kessler locking core stitch using No.5 Ethibond and a running suture using No.1 Vicryl. (Fig. 3) Postoperatively, he was placed in an equinus cast with DVT (deep vein thrombosis) prophylaxis and gradual rehabilitation with good recovery. Figure 3 Repair after closure of the Achilles paratenon. Achilles tendon rupture is often characterized by an acute onset of pain in the distal posterior portion of the lower leg. Patients often think they have been kicked, cut or hit in the back of the leg with subsequent difficulties ambulating or putting weight down on the affected foot. There is obvious leg swelling with a palpable defect in the Achilles tendon and a positive Thompson’s test. The Thompson’s test usually reveals absence of plantar flexion on squeezing the calf with the patient lying in the prone position. The diagnosis is often made clinically. Plain radiographs, ultrasonography, and MRI can also be useful to confirm the diagnosis. The MRI is the gold-standard for diagnosing acute Achilles tendon ruptures and can also confirm the diagnosis of a partial rupture which may not be clinically apparent. In our institution, we prefer operative approach with early mobilisation in an adjustable air cast boot. The usual regime is to apply a dorsal slab until the wound has healed. An adjustable air cast boot is then applied starting at 45 degrees of equinus aiming to reach 90 degrees by 6 weeks, at which point, weight bearing is allowed. Passive dorsiflexion is continued until range of movement equals contralateral side. The air cast is discarded 3 months after surgical repair. This case report highlights an unusual second rupture of the Achilles tendon at a different site on the same tendon following an initial traumatic rupture at the musculotendinous junction. This is a rarely reported injury in the literature. This previously fit and healthy patient had a traumatic rupture of his right Achilles tendon at the musculotendinous junction which was treated conservatively in an equinus cast. He subsequently developed a tendonitis and then traumatic rupture at a site 10cm below the initial rupture on the same tendon. This was treated with open surgical repair and rehabilitation. 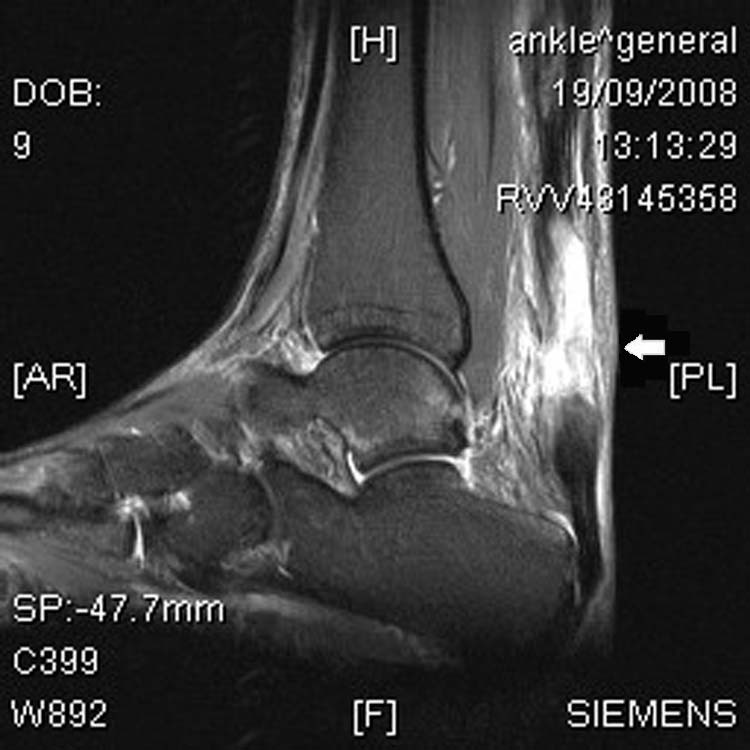 In conclusion, the presentation of this case study has highlighted the potential role for routine MRI scanning to assess Achilles tendon ruptures and identification of risk for a second rupture. 1. Cetti R, Christensen SE, Ejsted R, Jensen NM, Jorgensen U. Operative versus non-operative treatment of Achilles tendon rupture. A prospective randomized study and review of the literature. Am J Sports Med. 21 (6): 791 – 799, 1993. 2. Inglis AE, Scott WN, Sculco TP, Patterson AH. Ruptures of the tendo Achilles: an objective assessment of surgical and non-surgical treatment. J Bone Joint Surg 58A (7): 990 – 993, 1976. 3. Kellam JF, Hunter GA, McElwain JP. Review of the operative treatment of Achilles tendon rupture. Clin Orthop 201: 80 – 83, 1985. 4. Kuwada GT. A severe acute Achilles rupture and repair. J Foot Ankle Surg 34 (3): 262 – 5, 1995. 5. Leppilahti J, Orava S. Total Achilles tendon rupture. A review. Sports Med 25(2): 79 – 100, 1998. 6. Nistor L. Surgical and non-surgical treatment of Achilles tendon rupture: a prospective randomized study. J Bone Joint Surg 63A (3): 394 – 399, 1981. 7. Saglimbeni AJ & Fulmer CJ. Achilles tendon injuries and tendonitis. Emedicine, 2008. 8. Strauss EJ, Ishak C, Jazrawi L, Sherman O, Rosen J. Operative treatment of acute Achilles tendon ruptures: an institutional review of clinical outcomes. Injury 38(7): 832 -838, 2007. 9. Everything about Achilles tendons (2004-2006). Online, accessed 24th November 2008. 1 CT1 Trauma and Orthopaedic Surgery, William Harvey Hospital. Ashford, Kent. UK. 2 Consultant, Trauma and Orthopaedic Surgery, William Harvey Hospital, Ashford, Kent. UK. This entry was posted in Uncategorized and tagged Achilles tendon, Achilles tendon repair, rupture, traumatic. Bookmark the permalink.